The Golden Princess slot machine isn’t going to wow you with its theme, or stun you with its graphics. What it is prepared to do is shower you with multipliers, which is more than enough to satisfy most players. When you play the Golden Princess slot, you will instantly note that gold is central to its theme, just as it was to the Aztecs. 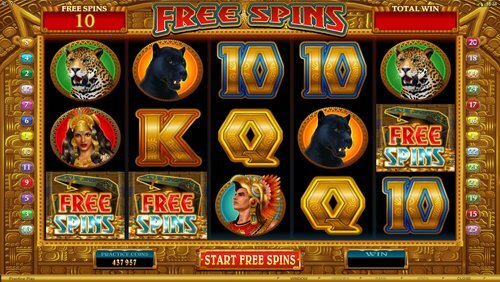 This part historical, part culture themed slot contains a smaller number of paylines than other Microgaming slots, with just 25 spread over 5 reels. That should make it cheap to play, shouldn’t it? You’ll find out shortly in our Golden Princess slot review, but next let’s take a look at the slot’s graphics. Golden Princess slot graphics’ are fair. They aren’t going to blow you away, though neither are they poor. They contain various Aztec tribe members, animals of the jungle, as well as the typical high playing card icons, coated in hold and in a blocky font, suitable for an Aztec themed slot. We told you we’d come to back to betting. Fortunately, the Golden Princess slot machine is suitable for all players, in terms of wagering limits. Players can stake as little as 1p per line, per spin on the Golden Princess slot. Players wishing to spend a little more can wager as much as £125 a spin on this game, which is still – believe it or not – rather cheap, all things considered. Golden Princess slot bonuses start with the wild. The slot’s wild is the Golden Princess logo, which can replace all other symbols in the game, and during this base game can offer a random multiplier of either 2x or 3x. 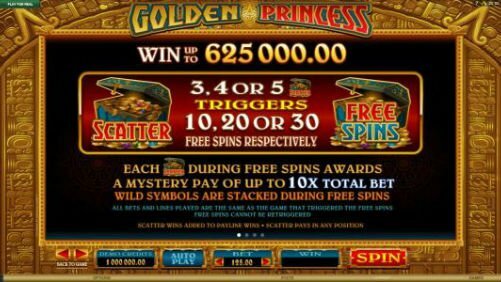 The Golden Princess game also carries a free spins triggering scatter. It takes the shape of a treasure chest, full of golden Aztec coins. Three, four or five of these icons are enough to trigger the free spins bonus round in this game. That is perfectly standard for any video slot, especially a Microgaming developed one. Once the bonus round has been activated, players will either win 10, 20 or 30 free spins. The amount you get is determined by the amount of scatters you located in the base game. Golden Princess video slot players will also note that during the free spins bonus round, their wins can pick up Mystery Pay multipliers of up to 10x. There is one other perk to this bonus game, and you’re sure to spot it. That final bonus is possibly the most rewarding of the Golden Princess slot bonuses, as all wilds will appear stacked in the free spins bonus. With stacked wilds and a multiplier of up to 10x, you can expect some seriously cracking wins. This slot is quite obviously one of Microgaming’s “let’s just release something” game, Unlike Hot As Hades for example. The Golden Princess slot machine isn’t going to wow you with its theme, or stun you with its graphics. What it is prepared to do is shower you with multipliers, which is more than enough to satisfy most players. 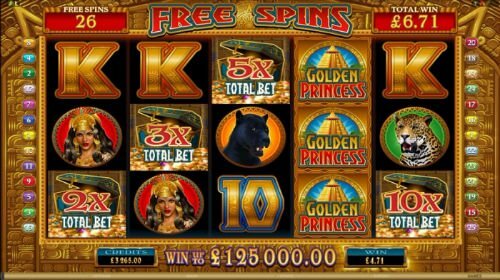 There are many Aztec theme slots out there, and without those multipliers and a lofty free spins bonus, the Golden Princess slot wouldn’t really stand out.